It’s often said a few pictures are worth thousands of words. But pictures can be a little misleading, when everything is globally interconnected. 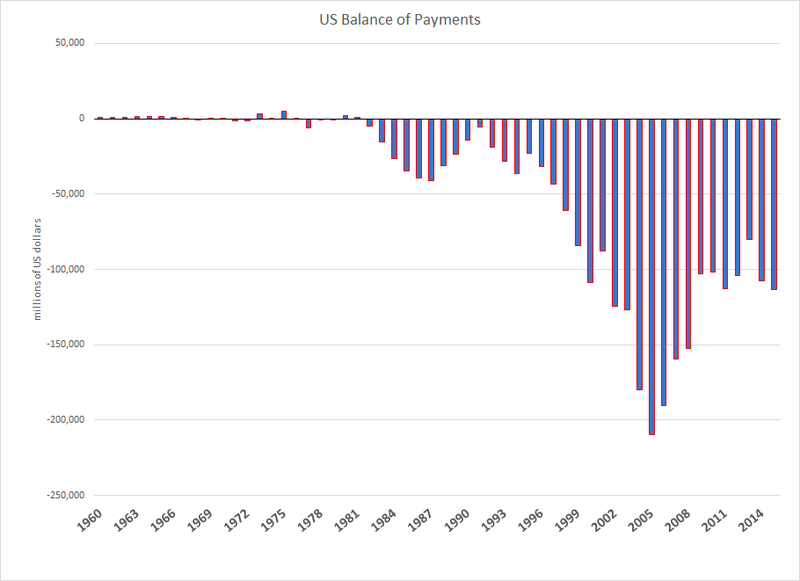 First, look at the standard view of the ever-widening US trade deficit and negative US balance of payments. Then, focusing on Mexico – a Trump whipping boy – let’s pry open the box and look inside to see what is traded back and forth. 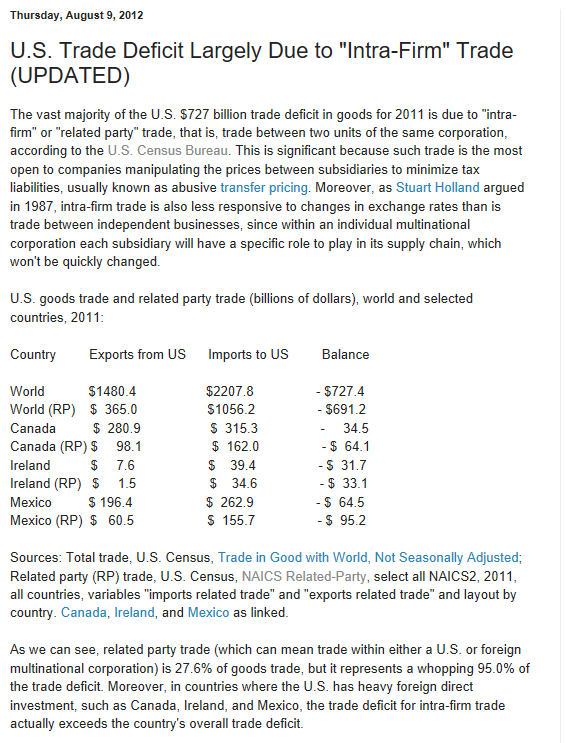 What the numbers suggest is that the greatest part of the US trade deficit is involved with “trade by related parties”, i.e. multinational companies importing parts and other goods to the US, sometimes for assembly here and export. Many of these are US companies who have used international operations to cut production costs, but then gain access to US customers on favorable terms through their time-honored sales channels. Just looking at the standard US trade statistics, the story is grim. 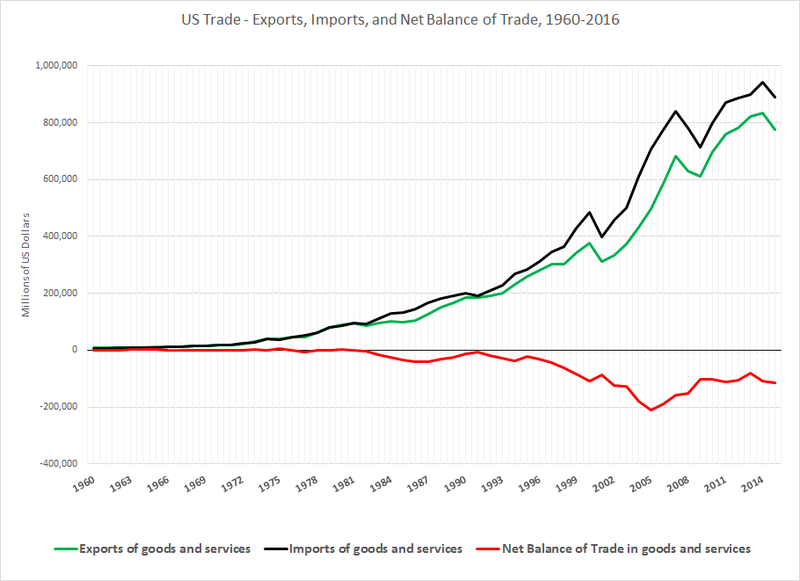 Imports to the US have persistently exceeded US exports since the 1980’s, with the negative balance soaring just before the Great Recession of 2008-2009 to around $200 billion. 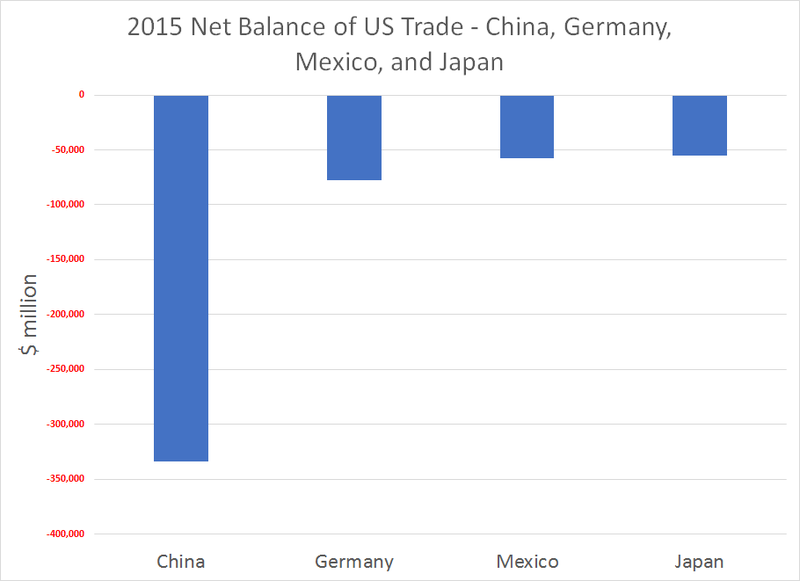 Four countries, China, Germany, Mexico, and Japan are the largest contributors to the US trade deficit, as the following chart shows. Sharp erosion in the US balance of international payments accompanies these import and export curves. But What Does Mexico Import Into the US? This is where we have to adopt a new way of looking at these facts. So, in recent years, US Trade authorities have begun to maintain a new kind of statistical data, relating to trade by related parties, a.k.a. trade between parts of the same (multinational) company. 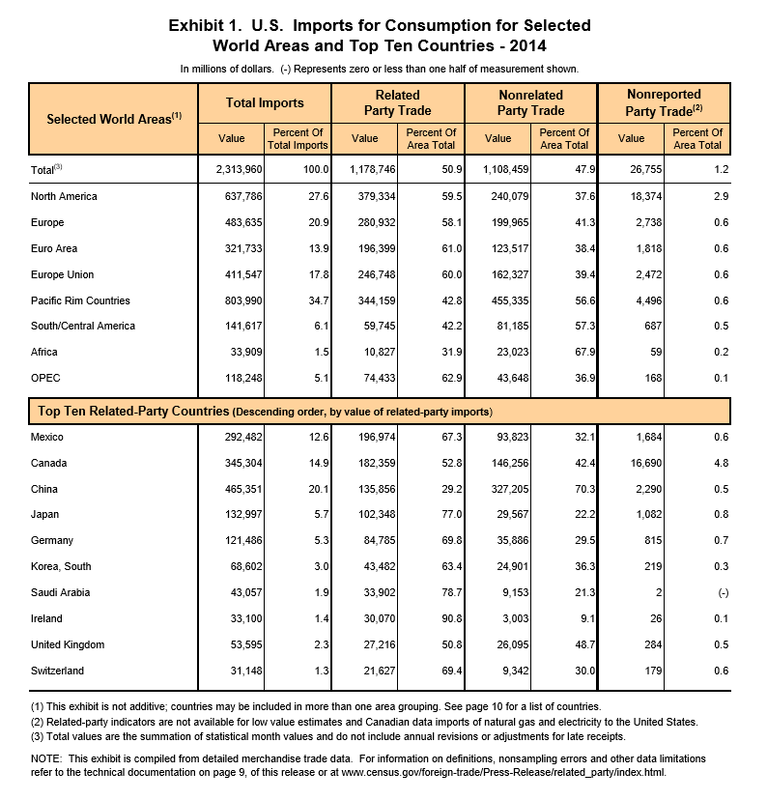 Mexico, in fact, has a large portion of this trade by related parties, as the following Table indicates. Readers may also want to consult J.W. Mason’s The Slack Wire What Exactly Does Mexico Export to the US? Now there are all sorts of measurement issues involved in measuring trade by related parties, and, of course, the import prices for within-company trade can be somewhat suspect. Thus, things are more complicated than suggested by trade in wine from Portugal and textiles from Old Blighty. In fact, a scholar at Harvard has one of the most compelling pictures highlighting the global supply chain. Thus, the 787 Development Team encompasses 50 suppliers located in 9 countries (Australia, France, Germany, Italy, Japan, Korea, Sweden, the United Kingdom and the United States). 70 percent of the 787s parts are produced abroad. So, this is the sort of complexity which enfuriates the “stranded white working class,” left behind when the factories move abroad, but the company marketing organization builds new offices in the nearby metropole. From which I also deduce that the conflict between Mr. Trump, Mr. Bannon, and powerful interests on the other side is likely to be a serious battle. This is not a win-win, as global trade always was presented (even though it has “distributional impacts”). Border taxes will intervene in these global commodity chains which have been constructed to further the pursuit of profits by multinationals. So border taxes will in fact also have distributional consequences, but these impacts will extend to company profits and involve reorganization of production. I mean this is like going to be a pitched battle. 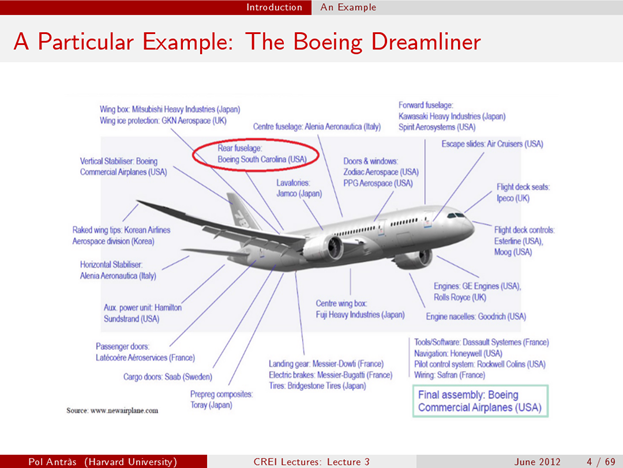 I was just marveling at the supply chain for the dream liner for a school project. Your framing of the supply chain in relation to border tariffs makes me think Boeing and other globalize companies will rally hard against them.